Krafting Kreations: It's a Circus! It’s Circle Circus that is! This stamp set has been in the catalog for quite some time, and I always wanted it, but didn’t get it until recently. I’ve only used it once before, so I just had to play with it more! That led to this really fun and playful birthday card which was the second card at the July Make and Take! I started off with a piece of Sahara Sand card stock cut at 4-1/4” x 11” and scored it at 5-1/2”. Then I cut a piece of Whisper White card stock 4-1/4” x 3-1/2”. 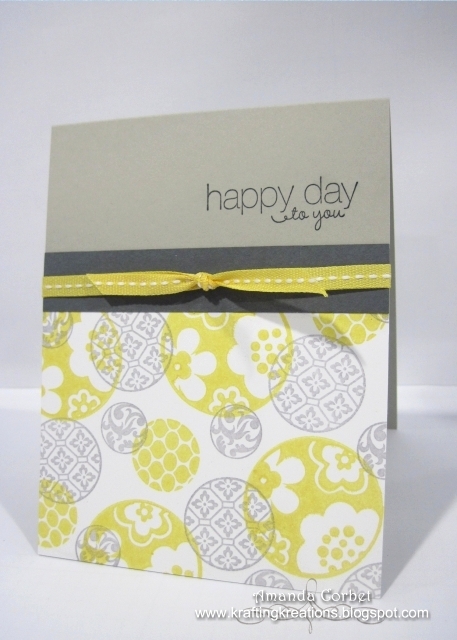 I stamped the images from Circle Circus in both Daffodil Delight and Basic Grey ink. My Basic Grey ink pad was running low on ink when I made my sample, which is why the grey circles are so light. You can achieve the same effect by inking the stamp, stamping onto a scrap piece of paper, then stamping on your card stock. After I had all the circles I wanted I adhered the card stock onto the bottom of my card front. Next I cut a piece of Basic Grey card stock 3/4” x 4-1/4” and adhered it on top of the edge of the Whisper White card stock. 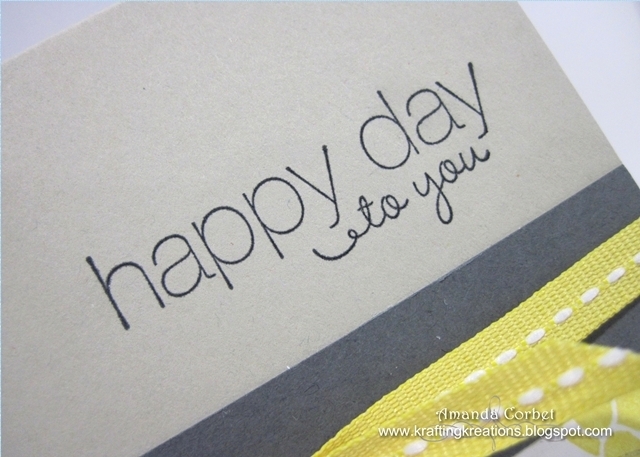 I stamped the greeting from Friendly Phrases onto the top of the card front in Basic Black ink. To finish it off I wrapped a piece of Daffodil Delight Stitched Grosgrain ribbon around the card front and tied it into a knot. That’s it! Super easy, super fast, and super cute! Even though it has more subtle colors it just seems so cheerful and fun. What do you think?